Want to watch the Masters this week? Stream Featured Groups, Amen Corner, Holes 15 & 16 and On the Range live on CBSSports.com and the CBS Sports App. 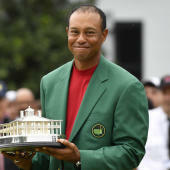 Check out LIVE coverage of Round 2 of the 2019 Masters by clicking here. So let's turn our attention to the ones that do as we break down the top of the leaderboard after the first round of the 2019 Masters. T1. Brooks Koepka (-6): When Koepka last played in the Masters, he had one PGA Tour win, no majors and was ranked 25th in the world. Koepka himself pointed to the experience of watching the 2018 Masters at home as a motivating factor in a renewed commitment to the game. Ever since, there hasn't been a better major championship player on the planet, and he seems extra motivated by the talk about his weight coming into the week. T4. Ian Poulter (-4): At the age of 43, Poulter has found something in the last couple of years that is keeping him competitive against the best golfers in the world. He rolled in five birdies with just one bogey and is on track to have one of his best-ever finishes at The Masters -- previous mark being his T6 in 2015. T4. Dustin Johnson (-4): There's nothing to be concerned about from a round of 68, it just seemed as though he was falling behind going head-to-head with DeChambeau down the stretch. T11. Tiger Woods (-2): As Koepka pushed the lead out late in the day on Thursday, Tiger might have been thinking about two or three short misses on the green during his first nine. His focus and excellent execution of the game plan across the second nine erased any lingering frustration from those misses in the moment, but now that we see the leaderboard as it stands, those are strokes he could've used to better position himself for Friday. T11. Rickie Fowler (-2): It was a solid start for Fowler. He struggled with a couple tee balls early but caught some good breaks, battled a little and kept his card pretty clean with just one bogey. There's room for improvement, particularly on the par-5s, he's still in striking distance on a day where the course was tricky for even the game's biggest stars.